Departing Alice Springs bright and early, we hit the road on our adventure of a lifetime. (For those commencing the tour at Uluru we will collect you from the Outback Pioneer Hotel or meet you from your flight at the airport). After a stop for lunch and our arrival at the Uluru-Kata Tjuta National Park, we travel to the base of Uluru where your guide will lead you on an interpretive walk, hearing of the Aboriginal law and religion (Tjukurpa). Continuing on, we meet our local Aboriginal Guide who will provide a once in a lifetime authentic Indigenous cultural experience with an interpretive walk to Mutitjulu Waterhole where you will hear the stories of the unique landscapes, art and culture of the local custodians, the Anangu people. We conclude at the Cultural Centre, where you may explore the displays and learn of the flora and fauna of this unique area. Rising early, take a short walk to a lookout close to our campsite to view sunrise over Uluru and Kata Tjuta without the hustle and bustle of the public viewing areas before heading off to Kata Tjuta, an Aboriginal word for “many heads” and a walk through the "Valley of the Winds" to explore its domes of which there are 36 in total. We walk through creek beds, domes and beautiful wilderness. 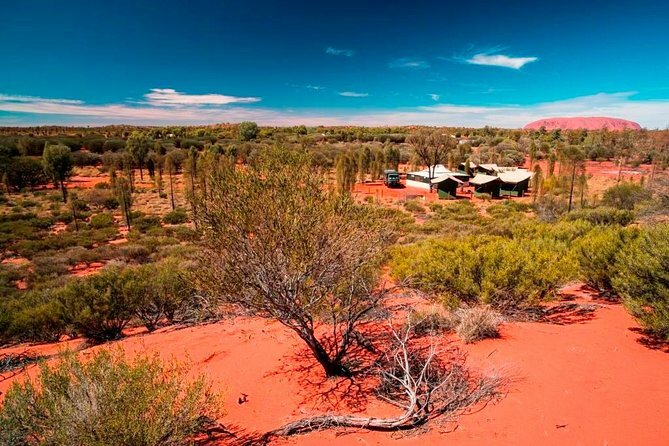 After the return transfer to Ayers Rock Resort your Red Centre experience comes to an end. I did not realize dark sky was as splendid as geology on the Earth. I should have book the evening tour for astronomy. This tour was amazing. Just about 12 People, great bus and a very good Guide!